Making appointments should not be hard! 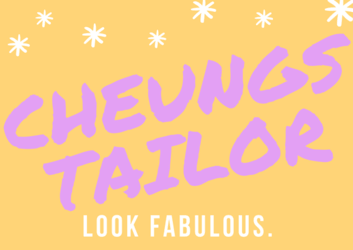 At Cheung’s Tailor Alterations we want to make it as simple as possible. Always remember walk-ins are welcomed, there may just be a wait for fittings. We will do our best to respond between 1 hour – 12 hours, if you do not get a response please email again. During the prom/ wedding season we do our best to respond as soon as possible. Due to quick appointments please respond as soon as you hear back and you will receive a final confirmation. ***When confirming times are based on Central Standard Time (CST) zone. Please make sure your email settings are set to CST or the appointment time will vary on your end. We will also will add it within the calendar invite. Please read through this entirely prior to making an appointment and follow the template below. To avoid to much email tagging please follow the template below copy and paste into email with the subject line: (Appointment – Type [check types below]) Copy & Paste below bullets. Military Uniforms needing more than just a hem or take in. Custom Projects – T-shirt blankets, Quilts, Suits, Etc. All dresses please bring any undergarments that you plan to wear with the dress the day of the wedding even if you are looking to have bust cups placed in. All dresses please also bring any shoes/ heels/ flats. This does NOT have to be the shoe for the wedding but it does have to be 100% the proper height. Suits: Please bring in shoes and a dress shirt for your fitting if necessary.